Nicolas Lancret initially focused on history painting and trained in the studio of Pierre Dulin, an artist who specialised in that genre. Lancret continued his studies at the Royal Academy of Painting and Sculpture in Paris, which he abandoned due to his rebellious character. Shortly afterwards he made contact with Claude Gillot, Watteau’s former teacher, resulting in a change of direction in his career and one that was fully confirmed in 1719 when he entered the Académie as a painter of fêtes galantes. Nicolas Lancret regularly exhibited in the Exposition de la Jeunesse from June 1722 onwards and in the Salon. During his own lifetime Lancret was considered a follower of Watteau, whose influence is evident in his early compositions, as are Gillot’s teachings. Nonetheless, Lancret was capable of creating his own style within the genre in works that lack Watteau’s magic but are imbued with a happy, festive mood and a more worldly air. 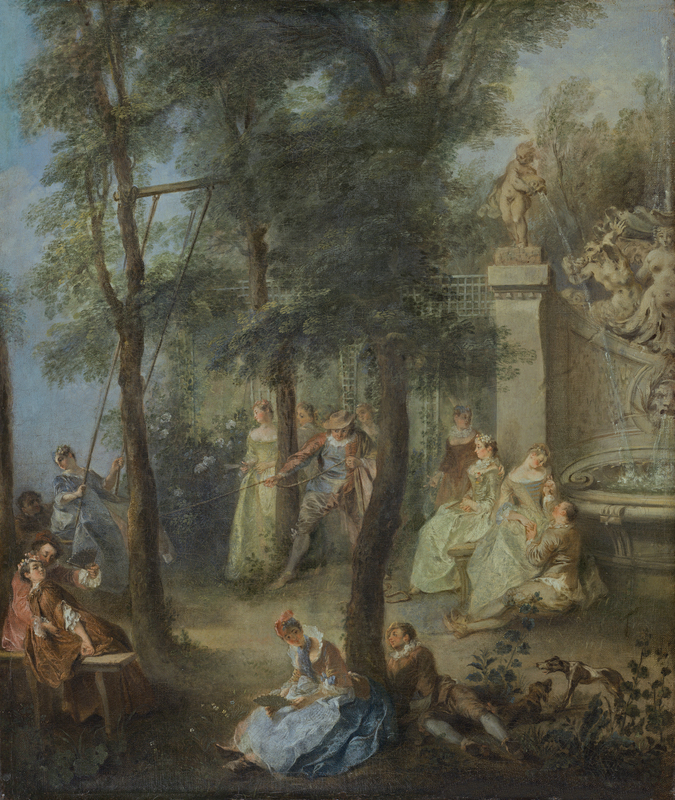 His compositions, generally located in outdoor settings such as gardens and the countryside, are more descriptive than Watteau’s and include a large number of different elements. Lancret developed a wider range of types of fêtes galantes than Jean-Baptiste Pater as he also depicted concerts, dances and country meals, informal gatherings, games, and scenes inspired by literary sources. In addition Lancret painted the Hours of the Day, the Ages of Life and the Elements. The Swing is dated to around 1735–40, falling with the artist’s mature period. 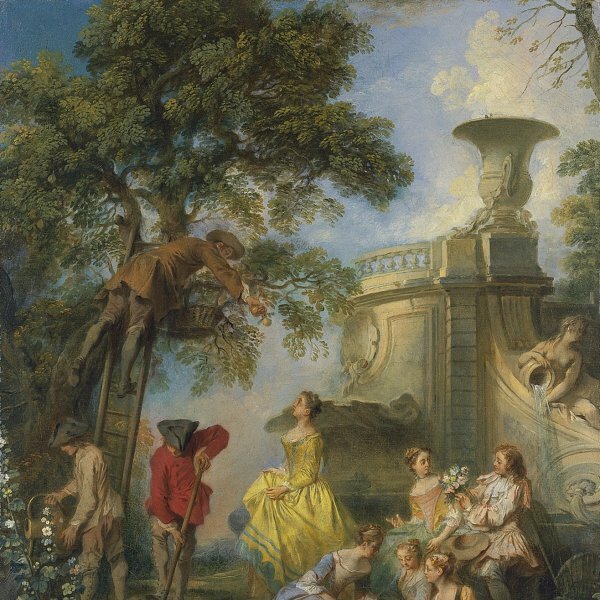 The episode takes place in a fine garden that includes elements that Lancret would use in other works, such as fountains and trellised pavilions. The figures are arranged in groups around three trees whose trunks create a sense of depth due to the spaces visible between them and also determine the arrangement of the different scenes. The couples engaged in amorous flirtation in the foreground are followed by the principal motif of the swing in the middle-ground to the left. A woman, seated on the swing, is pushed by two men, one behind her and the other energetically pulling on a rope in the middle of the composition. The background includes more amorous couples seated around the edge of the fountain. The rhythms of the construction continue in minor details such as the two dogs at the lower right edge, one of which is barking furiously. The colours are soft and delicate with an emphasis on greys, blues and greens, contrasted with warmer, finely harmonised tones used for the clothes and accessories. The canvas, which entered the Thyssen-Bornemisza collection in 1934, was formerly in the collection of Roger Pettiward in Suffolk, UK. In the 18th century it was in the Boyer de Fons-Colmbe collection and was auctioned at Le Brun in 1790. The Nationalmuseum in Stockholm has a drawing attributed to Gilles Marie Oppenort that reproduces in reverse the part of the fountain with the sculptures of a boy and a fish, both of which spout water. The drawing also has part of the sculptural group on the right, including the lion’s head.